If you’d like to receive our monthly calendar and weekly updates, sign up for our email list, and we’ll keep you Informed. After you sign up, you’ll also receive notice of emergency cancellations. Yes, please, keep me updated. Periodically, our ballroom is closed to the public to accommodate private events. These events are announced in advance, on our Calendar and in our e-mail newsletters. Hollywood Ballroom is located halfway along the driveway on your right. From I-495 (Capital Beltway), take Exit 30A, Route 29 North (Colesville Road/Columbia Pike). Travel about 4 miles on Rt. 29 north. Turn right onto Industrial Parkway. Turn left into the driveway of the second building on the left. Take exit 33, Route 198 West, towards Burtonsville. Travel about 3 miles on Route 198. Take ramp on left to Route 29 (Columbia Pike) South. Travel about 4.5 miles south on Route 29. Turn left onto Industrial Parkway. Take Route 29 (Columbia Pike) South. Travel about 13 miles past Columbia. 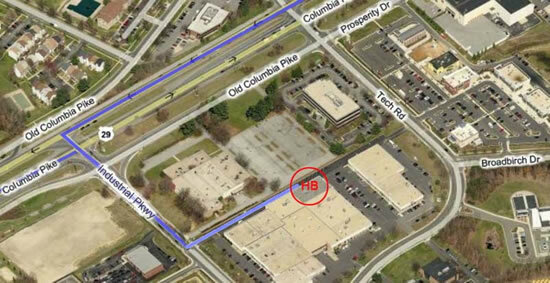 Take Exit 16, Columbia Pike (29) South. There is plenty of free, well-lit parking at Hollywood Ballroom—diagonal spaces adjacent to the entrance and a large parking lot between Zip’s and our building. Take the Red Line train to the Glenmont (Md.) station. Take Ride-on Bus #10 toward Hillandale. Consult the Ride-On bus schedule. Metrobus — For bus routes, consult the Washington Metropolitan Area Transit Authority. Our hours of operation are driven by our schedule of dances, lessons, classes and special events. For hours each week, consult our Calendar . If you have lost or found an item, please check with the front desk attendant. While we cannot be responsible for lost or missing items, we will do our best to help you locate an item. If no one claims an item within a few weeks, we will either donate the item to a charity or dispose of it according to our best judgment. Hollywood Ballroom Dance Center respects your privacy. Any personal information you give us will be used only to respond to your inquiry/request or to help us internally improve our services. We do not sell or rent information to third parties. We do not participate in any form of spam. If you elect to be on one of our mailing lists, you can request to be removed at any time and your request will be honored. 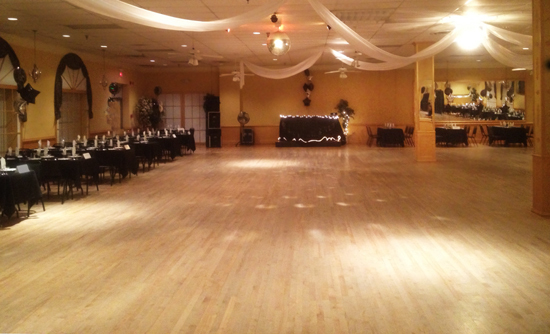 From time to time images may be recorded of people and events at Hollywood Ballroom Dance Center. These images may be used for publicity, training, and/or sharing on the web and on social media. By attending an event, you give consent for your image to be used in this manner. If you do not wish to have your image recorded, please let the person recording the images know. While we do our best to honor your request, it is not always possible and your likeness may appear in some images. We expect everyone at Hollywood Ballroom Dance Center to be treated with respect and courtesy. If there is a problem, please let management know. We reserve the right to refuse service or entry to anyone for any reason. We regret that we cannot give refunds for tickets purchased in advance. West Coast Swing Dances and Latin Night Dances: Reserved seats are not available. If you have special needs, please contact us. Social Ballroom Dances: Groups may request a table in advance. • Anyone who pays in advance may reserve a seat. • Most of our tables seat 8 people; a few tables seat 2 or 4 people. We do our best to accommodate all requests; we try not to split groups; we appreciate your cheerful willingness to share tables. • We will hold reserved seats for up to 30 minutes after an event starts (the first pre-dance lesson is considered the start of the event). Please let us know about any problems, broken links or any suggestions you might have. We sincerely value your feedback. Our website is meant to be informative as well as easy to read. It is written in an editorial style, not a technical style. Except for posts containing details obviously meant to be precisely, technically correct, we have taken some editorial liberties for the purpose of keeping the website easy to navigate and easy for the majority of our viewers to quickly follow.